Evidence is accumulating for an important new health message: get out of your seat. 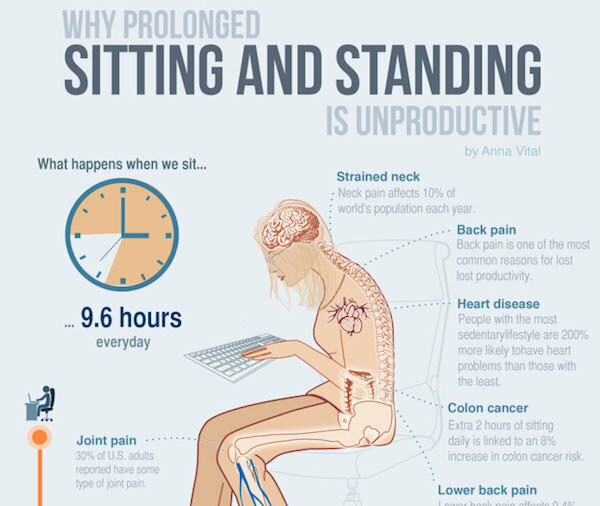 Even for people who exercise regularly, spending too much time sitting may be a health risk. In a study published in Annals of Internal Medicine in 2015, Canadian researchers led by Avi Biswas concluded that prolonged sedentary time was linked to poor health outcomes regardless of exercise habits. Those poor health outcomes include increased incidence of cardiovascular diseases, Type 2 diabetes and certain forms of cancer, as well as mortality. Depending on occupation, many people spend much of their work day in a chair. They may also spend their evenings on the sofa, and spend the time in between work and home sitting in a car. Breaking up all that chair time may require some preparation. Banerjee suggests making a plan to get up regularly if you know you’re going to be sitting for several hours. For example, if you’ll be working at a desk all afternoon. “The suggestion is to get up for at least two minutes every 20 minutes when you’re sitting for long periods of time,” Banerjee says. However, she recognizes that for some occupations or in certain circumstances – such as customer service roles or tasks that require prolonged concentration – that may not be practical. “In that case, what you could do is get up for five minutes every 45 minutes,” Banerjee suggests. She also notes that those breaks don’t have to involve rigorous activity. There are plenty of free apps compatible with different smartphones to help get people out of their seats. Because so many people sit a lot during their work day, workplaces can be an ideal place to start promoting regular movement. Measures like standing or walking during meetings are simple, but make a difference. “At first it might seem disruptive, but you become accustomed to it – especially if you’re promoting the culture of reducing sedentary behaviour,” Banerjee says, adding that it’s also important to be mindful that there may be people with musculoskeletal issues or disabilities who may not be able to stand or walk during a meeting. Do household chores, such as folding clothes, washing dishes or ironing, while watching television. Stand to read the morning newspaper. Wash your car by hand rather than using a drive-through car wash.
Move around the house when checking text messages and email on your mobile phone. Leave your car at home and take public transit so you walk to and from stops and stations. Walk or cycle at least part way to your destination. Park your car farther away from your destination and walk the rest of the way. Plan regular breaks during long car trips. On public transit, stand and offer your seat to a person who really needs it. Get on or off public transit one stop or station earlier. Stand and take a break from your computer every 20-30 minutes. Take breaks in sitting time in long meetings. Stand to greet a visitor to your workspace. Walk to your colleague’s desk instead of phoning or emailing. Drink more water. Going to the water cooler and the toilet will break up sitting time. Suggest, encourage and take part in organizational fit breaks: timed five- or 10-minute fit breaks for employees offered in the morning and afternoon.